Collectively, as a church in January, we begin 21 Days of Prayer and Fasting. Together, we faithfully seek God first, trusting in His power alone to create lasting impact in our lives, our church and our world. Fasting is simply abstaining from something - traditionally food - for the purpose of seeing, savoring, and seeking God more clearly and earnestly. Jesus took it for granted that His disciples would fast and even began sentences with “when you fast…” (Matthew 6:16). Jesus predicted that future believers - us - would fast to draw closer to Him and to testify that we are awaiting our future physical joining with our Savior - “… But someday the Groom will be taken from them and then they will fast…” (Mark 2:20). 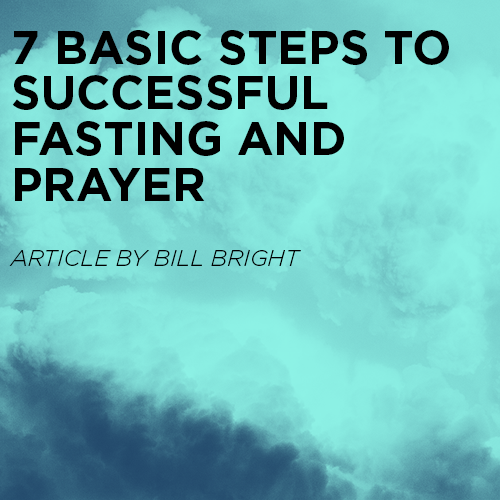 He also made it very clear that some breakthroughs would only occur in our lives through concentrated prayer and fasting - “This kind only goes out by prayer and fasting…” (Matthew 17:21). There are many models of fasting you can follow from Scripture. One popular fast is the Daniel fast - a temporary diet consisting of only water, fruits and vegetables. You can read the whole story of Daniel in that book in the Bible and you can even buy Daniel Fast cookbooks at Christian bookstores. Some will do bread and water. Some simply give up soft drinks or sweets. The point is laying something physical down to pick something spiritual up. And like King David we don’t “want to offer a sacrifice that costs nothing.” If you don’t like chocolate, chocolate is not the thing to fast! The heart of the fast -whether a private one or like this corporate one - is Jesus. The point is not to get bogged down so much in the legalism of the fast that we don’t seek and enjoy Him. And the point is not just to not eat. The point is to replace the flesh comforts with more Scripture, more prayer, more journaling, more time with God. If we don’t eat and don’t spend time with Jesus, we just starve ourselves both physically and spiritually - and that’s no fun for anyone! and the testimonies that come in are wonderful and even miraculous. The short answer is everything. As you allow more and more opportunity to draw near to God, focus first and foremost on Him and drawing closer to Him. Letting Him peel away layers of distraction and flesh as He lays His hand on places in your life through His Spirit and His Word. Pray about anything and everything on your heart. Also, fasting is a powerful time for targeted, focused prayer. Pray fervently for breakthrough. For revival. For direction. For that lost child. Corporately, we ask you to pray for the vision of New Life Church - that more people than ever before will get connected to their God-given purpose. Cover the pastors and leadership of New Life. Pray for fresh vision and anointing. Pray for revival. We truly believe this is going to be a life-changing time together. Please let us know through prayer cards and praise cards and/or email how we can be praying specifically for you during this time, and as God moves please send us your story and testimony to info@newlifecanton.com so that we can celebrate with you!